The basis of our fee is the portion of inheritance, so that we only take action in debt-free and unmortgaged inheritance matters. The heir finder should make huge bureaucratic expenditure, when his efforts should be rewarded with success. If a heir is located, he will come to the interest of a capital gain. As a result of this there exists the heir finder’s entitlement to remunerate him expenses and the expenditure of the research out of the relevant portion of inheritance. We are working at our own risk when we conduct searches for entitled persons at home and abroad. When the inheritance is disbursed to the entitled only then is our fee payable. There are no expenses or payments for clients or heirs in advance. Our contingency fee we agree with the located by us heirs solely. The amount of our fee is guided by the difficulty level of our research. If our research is unsuccessful we shall bear all our expenses ourselves. The sale and the economical disbursement of the inheritance to the heirs is a component of the agreed fee. 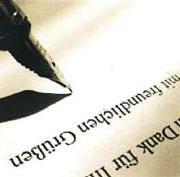 The requirement of a fee agreement is based on a decision of the German Federal Supreme Court (BGH, of 23rd September, 1999, III ZR 323/98). Upon this the heir finder is obligated, in order to safeguard a fee for his services, to conclude a fee agreement with the located heirs, otherwise there is no claim for remuneration or reimbursement of expenses. Therefore it’s fair enough, that a disclosure of our research results takes place after signature of the fee agreements by all pretenders to the estate. The success-related and risk- free for clients and heirs agreement prevents an usurpation of our often troublesome, with great cost and enormous amount of time worked out results for free. A schedule of fees for heir finders does not exist in the German legislation. Historically, fees up 33% plus VAT from the net estate have become the norm in-country and in our business and are considered acceptable by courts. A partial percentage fee ensures that payment and expenses are always in relation to the amount of the relevant portion of the inheritance. Fees for heir finders are described in following German publications: Joachim/Pohl: Estate Administration (Nachlasspflegschaft), 3rd edition 2006; Zimmermann: The Estate Administration (Die Nachlasspflegschaft), 2001). As a calculation basis for the amount of our fee is the actual estate value which is paid to the heirs plus of the legal VAT. All expenses of our office are enclosed in it. When inheritance tax is due our fee is considered a liability of the estate so that a considerable portion of our service is counterbalanced by saving part of the inheritance tax. Unfortunately, in our branch there are also "black sheep". They can be identified, for example, if they demand advanced payments or they compel estate pretenders pressed for time to sign a fee agreement.